Portable software program H2testw has been designed to test the integrity and the size of usb flash drives, memory cards, hard drives and even network shares. The software program works by writing, reading and verifying test data that is written on the selected device. Existing files that are already stored on the device will not be harmed if the tests do not find any defects. This does however mean that existing files can be harmed if defects are found on the device. It is therefor recommended to clean the device before running the test program. 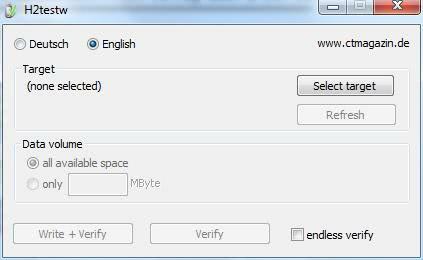 The device integrity and size test will write files with a size of one Gigabyte to the selected storage device. All files that are written to the device will be named x.h2w with x starting with 1 and counting up. The software will then verify the files that have been written to the medium and display a report once the verification has been completed. The program will display a rating and a detailed report on the data that was written correctly and incorrectly. The tool can for example be used to test if the advertised capacity of the USB flash drive or hard drive has the correct size. H2testw is compatible with Windows XP, Windows Vista and Windows 7 and does not require administrative rights.